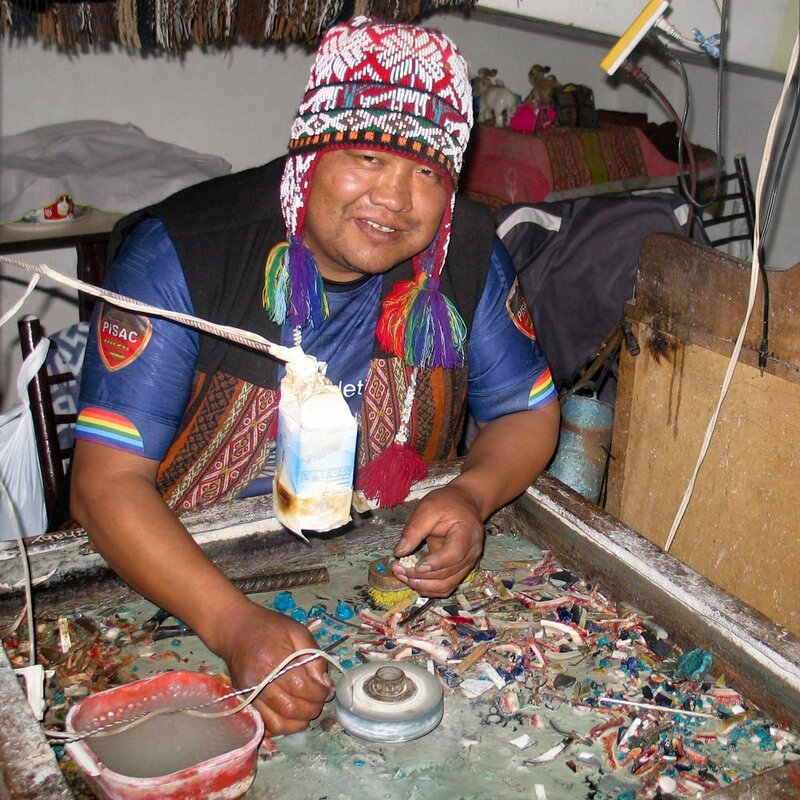 Big Bay Quispe Sullca apprenticed for several years before opening his shop in Pisac, Sacred Valley, Peru. Everything he creates comes from his heart. 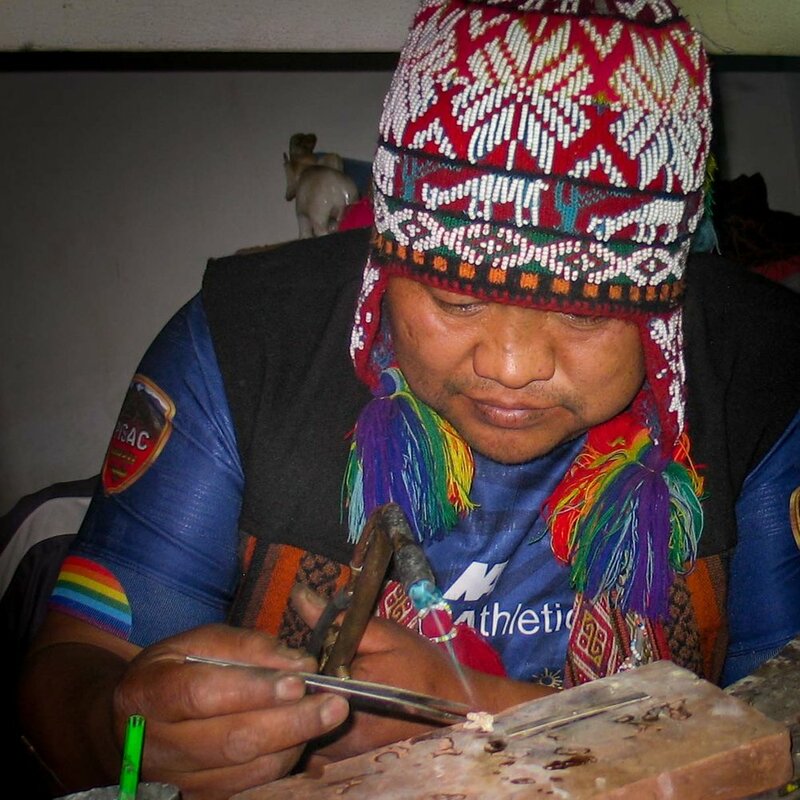 He shapes and hammers the silver from scratch and then depending upon his vision for each pieces, he add stones and or shells. He prays as he buffs and shines each work of art. Daily, he travels to Pisac from a village 45 minutes away where he lives with his wife and two children. We are pleased to be supporting this talented artist. It was hard to not be blown away by the complexity of the weavings we saw in this indigenous community of weavers living at 14,000ft above sea level. Upon our arrival, they greeted us by showering handfuls of bright flower petals onto our heads, and then immediately nourished us with delicious and hearty food. Each Village has their own style and men and women weave different patterns. Everyone, even the children, help out at different stages of the creation of these textiles, and thus contribute to carrying forward at least a little bit of this ancient craft. The villagers spin the llama or sheeps wool into yarn, then use naturally found ingredients to dye the skeins of yarn into the exquisite colors they use for the woven textiles. The men in these communities also weave. Traditionally the women are responsible for managing the finances for the whole family. The younger generations are becoming less and less involved with these ancient skillsets. Most are more interested in the pop culture brands found in mass media and will tend to venture far from the villages they were raised in, in the hopes of finding a more prosperous life. We believe our efforts support these villagers in maintaining a health economy for all, so that the children of these skilled weavers can be a part of walking these valuable traditions forward for many generations to come. It is an absolute honor to share these stories, making my family theirs, and my business, theirs.